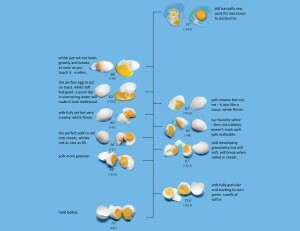 According the new buzz about egg cooking, This chart lacks the cooking times. For how long you cooked the eggs? All of these eggs were cooked for 1 hour at the temperatures indicated. It is possible to cook eggs at higher temperatures for shorter times to achieve special effects (I have a separate chart for that), but I tend not to cook that way. Within an hour the eggs reach the temperature I want. After 1 hour, change occurs only slowly. I have been cooking eggs for 1 hr 40 mins at 149 f in circulator and whites are still very runny. Not firm at all. 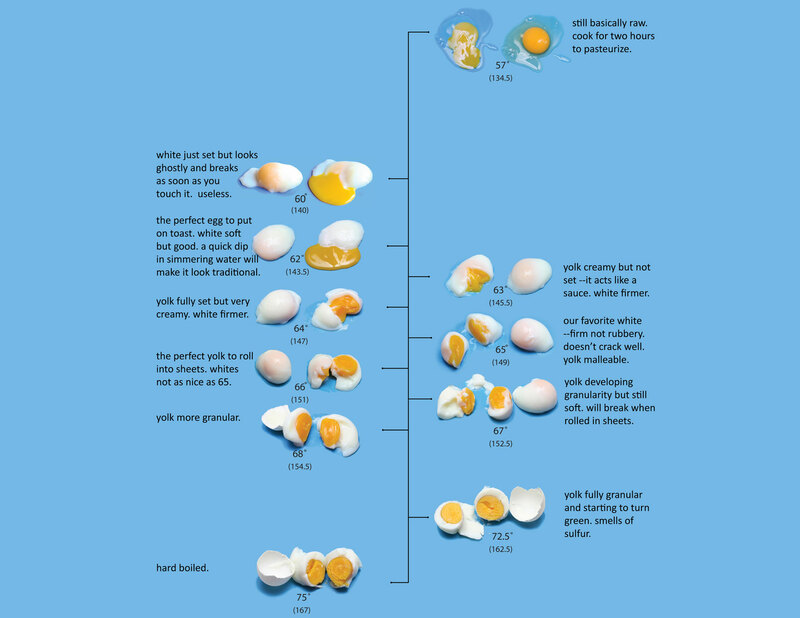 Yolks are as you describe in the chart. What might have gone wrong or what have I done wrong? Are you using the new circulator? Make sure the offset isn’t set to 3 degrees. If it is your eggs will be a runny 62 C. You can eaily verify temps by doing an ice bath calibration. Let me know. Just tried cooking the eggs at 154.5 for 1 hr and had similar result. Yolks were cooked as indicated on chart, but whites were very liquidy. They basically dripped off of the semi-solid yolk immediately apon being peeled. Sorry, I just saw that you said whites. The thin white will remain runny at these temps. It acts a a release agent for the thick whites. We typically crack the eggs on a plate, brush aside the thin white goop, and slide the egg on the dish. BTW, I would turn down your circulator after an hour to an our and 15 minutes to arrest yolk changes. I’m particularly interested in how this method will deal with pathogens. Will it be safe from salmonella and avian flu virus? I don’t know about avian flu virus, but this technique is much more effective than standard cooking at eliminating salmonella.